Just days before Serena Williams made U.S. Open grand-slam history, Nike had already crowned her the world's greatest athlete in its newest ads. The commercial, as part of the "Unlimited Series," takes a look at several athletes, including Simone Biles and Mo Farrah, but the end of Williams' ad is quite poignant. In July, during Wimbledon, Williams was asked about being the world's greatest female athlete, and her answer set the reporter straight. “I prefer the words ‘one of the greatest athletes of all time,’” Williams said. 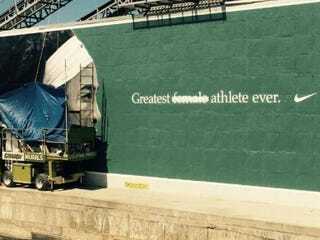 In addition to the Nike commercial, a banner is also on display in Brooklyn, N.Y., celebrating Williams' U.S. Open appearance. There's no doubting that Williams is definitely the greatest athlete ever.